Contributing editor Michael Leonard spoke recently with author Christina Baker Kline about her latest novel, Bird in Hand , on turning neurotic obsession with terrifying what-ifs into source material, and what many people struggle with in their lives and marriages. Interviewer Michael Leonard: Bird in Hand has such a rich emotional resonance; you really strive to bring forth the inner lives of your four main protagonists. Where did you get the inspiration for such a story? Christina Baker Kline: The story of Bird in Hand emerged slowly, from a number of sources, but it first began as a “What if?” question. Just over ten years ago, I moved from New York City to Montclair, New Jersey, with my husband and two young boys. After many years of relying on subway trains and taxis, suddenly I was driving on unfamiliar (and confusing) highways with not only my own precious human cargo in the backseat but other mothers’ as well. Late at night, I’d terrify myself with “What if?” questions, such as: What if something happens to one of these children—my own or someone else’s? What if somehow I’m responsible? As I turned these kinds of questions over in my mind, I realized—with the writer part of my brain—it would be a lot more useful and less neurotic to use them as material than to keep pointlessly obsessing. The novel begins with Alison’s terrible accident - but it almost didn’t happen. Alison wavers over going to Claire’s book party, but at the last minute Charlie talks her into it. Alison’s friendship with Claire is complicated - over the years there has been anger, competitiveness, and frustration. What other issues do you think are at the heart of their fractured relationship? Throughout their friendship, Alison and Claire, who are as different as two friends can be, have filled gaps for each other. They are alternately admiring and jealous of these differences. It’s interesting that Alison was once the compass that not only kept Claire on course, but also Alison’s own marriage and her domestic life. Now she feels uncomfortable and out-of-place, even questioning her own judgment. Is the life she’s chosen with Charlie really enough for her? Alison never consciously chose the life she finds herself in. In the novel I talk about how she is living a “life she didn’t plan for but had grown to love.” She didn’t plan to give up her career when she had children, but, like many women, she found that the alternative was too difficult to navigate. So to answer your question, the life Alison has with Charlie is not really enough for her, but she doesn’t consciously know that when the novel opens. After the accident you describe Alison’s life as “cleaving into two sections,” and all of the things that seemed solid to her a month ago crumble: “the ground had shifted; and she’d lost her balance.” How does the accident become a catalyst for all of Alison’s regret and remorse? I wanted to explore how these events and decisions come to the fore in the wake of an accident like this. I found Charlie’s reaction to the accident terribly unsettling, especially his deference, his frustration, even his impatience. It’s as though Alison has gone and “screwed-up again.” Can you explain Charlie’s reaction within the wider framework of their marriage? I know that Charlie’s response can seem unsympathetic. But more than one man has told me that secretly he feels like Charlie. Men have told me things at dinner parties about their wives that I put in Charlie’s mouth. I wanted to explore what it would feel like to be that person – the person who can cheat on his wife without much regret, who sees his wife’s weaknesses acutely because he is in love with someone else. And is in love with someone else, in part, because he sees his wife’s weaknesses acutely. Throughout, I felt that Alison is forced to carry the greatest of burdens, especially when she realizes Charlie is falling away and quite possibly no longer in love with her. Can you speak to Alison’s realization that her marriage may be a fraud? How soon do you think she recognizes this? Toward the end of the novel, Alison acknowledges that long ago she knew, deep down, that Charlie had feelings for Claire – perhaps even before they were married. I think that a lot of times people get married realizing that things aren’t perfect but hope their love will grow or that the other person will change. And sometimes it does. But not often. Do you think Alison heeds the warnings from her mother that Claire is devious and not to be trusted? At what stage do you think Alison gets an idea of Charlie and Claire’s affair? Does she ever catch on? Alison’s judgment is clouded because she thinks that her mother is suspicious of Claire for the wrong reasons. Alison still acts like a teenager, in some ways, with her mother. It’s hard to break those old patterns. And Alison does not want to believe that Charlie might be having an affair with Claire. She’s living in denial. Throughout the novel, you really get a sense that Charlie and Ben each want what the other’s got. Ben wants Charlie’s life of marriage and he wants children. Charlie, at the other end of the spectrum, is trapped in his “maze of bourgeois concerns and aspirations.” Is the dichotomy between the two men intentional? Do you see any similarities between them? I don’t think it’s easy to be a man these days. I think Charlie and Ben are both smart, ambitious men who feel the burden of expectation, their own and others’. But Ben is much clearer about what he wants professionally – and personally, for that matter. Charlie is in a muddle. Alison’s lurking fear is that Charlie’s silence masks a “fundamental disappointment,” and the always intuitive Ben senses pretty early on that Claire is silently pulling away. How does this knowledge help them both rise above their current circumstances? I think that despite Ben’s sadness, he is inherently rational and understands Claire in ways she doesn’t even understand herself. And Alison, despite being in love with Charlie, also finds him hard to live with in some ways. I didn’t want the ending of the book to be tragically sad. Lives go on. Ben and Alison may be happier than Charlie and Claire, ultimately. Do you think Claire and Charlie’s affair was inevitable considering their past feelings for each other? I made a conscious decision to start the affair before the book begins because I didn’t want the accident to be the catalyst for it. I wouldn’t say that the affair was inevitable, but given that they all ended up in or near New York and remained friends, I think it was inevitable that they would have to deal with their unresolved feelings for each other someday. How much of Charlie’s feelings for Claire are still colored by their time as students, when they lived a bohemian life in the UK where Charlie first met young Ben and vibrant, life-affirming Claire? A lot. Most, I would say. Charlie’s in the midst of a midlife crisis, to invoke a cliché, and Claire reminds him of a time when he was young and free. He hasn’t found satisfaction in his career or in his marriage, so he romanticizes that earlier time in his life and the people in it – particularly Claire. Claire struggles to find a place for herself. Out of all the characters, I found her the most self-obsessed - she worries about money and her future with Ben, and also her passion for Charlie. "It wasn't like Claire had fallen out of love with Ben...it as more like she had drifted…” Explain this in terms of Claire’s ambivalence towards Ben. Ben represents a kind of stability for Claire that she never had. But as she becomes more self-actualized and more confident, she doesn’t need that externalized stability. She feels hemmed in by it. After the accident, Claire is desperate to talk to Charlie to find out what he’s thinking and feeling. She’s also wracked with the immensity of her own betrayal, and the terrible cruelty of what she and Charlie were doing. What do her emotional conflicts tell us about the kind of person she is? Oh, she’s kind of a mess. She’s always pulling Charlie in, then pushing him away. She’s fundamentally ambivalent about what she wants. Her own father was cold, and her mother was an alcoholic. She didn’t have good role models and stumbles around blindly, trying to satisfy her own desires. And those desires are conflicted. In the scene in the airport, Charlie is the one who pushes Claire to say she wants to leave Ben. But then Claire spills the beans and forces Charlie to tell Alison. It’s a botched job. Why do you think Claire is ashamed of her conventionality and her parochial need for direction? What is Claire missing from her life? Claire married Ben because he is sure of what he wants (her – and to be an architect); he also makes a decent amount of money and can support her as she attempts to make a go of it as a writer. He fulfills many of her needs. But she is not passionate about him. Out of Claire, Alison, Ben and Charlie, which character do you feel is the most self-delusional? Maybe Charlie. He is in denial about the repercussions of leaving his young children – and also about what it will be like to live with Claire. At the very end, he begins to realize what he’s gotten himself into. The story is told in layers, with the present laid over the past and the past over the present. How difficult was it to structure the novel this way yet keeping the present-day events moving along at a brisk enough pace? It was very difficult. Structuring this book was the hardest part of writing it. It took me years to figure out how to keep the story moving forward while giving the characters breathing room in the past. Obviously the search for happiness, the price of self-deception, and the ramifications of living a lie are powerful themes that reverberate throughout. What else are you telling us about marriage, friendship and family? At one point in Bird in Hand , a character wonders, “Who breaks the thread, the one who pulls or the one who hangs on?” I wanted to write about love and loss and betrayal and renewal. I wanted to write about characters who don’t know quite what they want or how to get it, and are pushed into decisions by circumstances beyond their control. One of my epigraphs for this novel is a quote from The Age of Grief , by Jane Smiley: “Confusion is perfect sight and perfect mystery at the same time.” This holds true for all of my characters in different ways—in all of my novels. Do you think your characters’ struggles - that of raising children, running a household, holding down jobs, (and even coping with infidelity!) - are fairly typical of modern family life? Yes. Given the response I’ve received to this novel, many people are wrestling with these kinds of questions in their lives and marriages. There are no easy solutions for your characters. They struggle and are all victimized by one another, yet once the dust has settled, they move on. Do you think Ben, Charlie, Alison and Claire eventually find peace and happiness? Yes, as it is for all of us in the “real” world, these characters will survive to experience moments of great happiness and great disappointment. I wanted the story to end with each character poised on the brink of – something. The future, whatever it may be. You strike a lovely balance between external description and your characters’ inner voices. Did these people come from real people or are they a part of you? Do you have a favorite character? I was constantly struck by your lyrical and beautifully rich prose style. Does your writing come to you easily, or do you sometimes struggle to get the prose flowing? Writing comes pretty easily, once I get going on a novel. But revision is painstaking. I revised this book many times. I worked hard at getting each word right. Was Bird in Hand a hard novel to write? Do you have another novel planned? Bird in Hand is the hardest novel I have ever written. I wrote a draft, put it aside, wrote and published The Way Life Should Be , and then returned to Bird in Hand . It took forever! I am now working on a novel based on the story of the orphan trains that ran from New York to the Midwest in the early-20th century. It’s partly historical, and I’m doing a lot of research. It’s completely different from anything I’ve ever done. What aspects of Bird in Hand would you like your readers to remember? What lessons - if any - would you like us to take away from the novel? The questions I explore in Bird in Hand —about true love, marriage, ambition, dreams, and happiness—aren’t simple ones. I want readers to identify with one character and then another; I want them to think about how the choices people make define who they are in the world. Annie Dillard says, “How you spend your days is how you spend your life.” I hope this story inspires people to think about their own lives and motivations. Christina Baker Kline is the author of three novels, The Way Life Should Be , Desire Lines , and Sweet Water , and is Writer-in-Residence at Fordham University. She lives outside of New York City with her family. 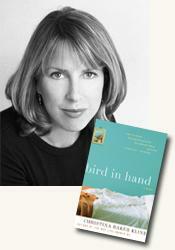 Contributor Michael Leonard interviewed author Christina Baker Kline, author of Bird in Hand (see accompanying review), about her book for curledup.com. Michael Leonard/2009.